Help LOCKN' and Starr Hill Brewery name LOCKN's official beer of 2017! Help LOCKN’ and Starr Hill Brewery name LOCKN’s official beer of 2017! Attention beer lovers and brew enthusiasts! 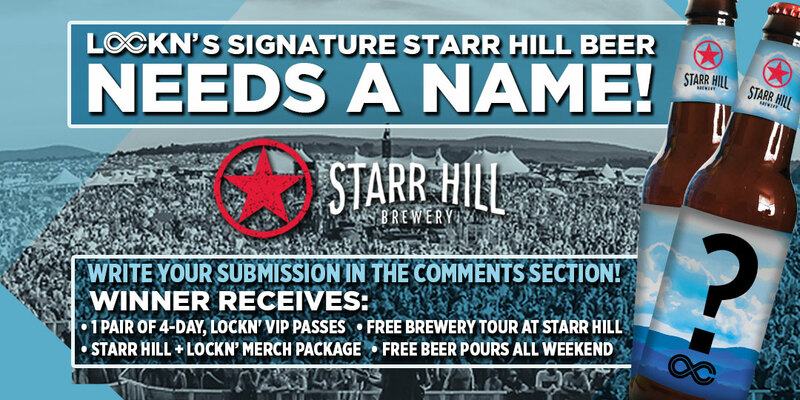 Starr Hill Brewery and LOCKN’ need YOUR help naming our official beer of LOCKN’ 2017. This light and refreshing beer is the perfect balance of hop bitterness and honey-like malt body. Lightly hopped with Cascade, the Honey malt and oats bring a bit of sweetness for a smooth mouthful and clean finish. Help us name this beer! Submissions are accepted between Wednesday, July 12 and Friday, July 21. Finalists will be chosen by popular vote, and voting will occur Tuesday, July 25 – Friday, August 4. Post your ideas in the comment section of this Facebook post and the winner will be announced on Monday, August 7. If there’s one more pairing we can’t get enough of, it’s live music and beer. Get creative, get inspired, and get thirsty. This contest is definitely one for hop heads.